Posted 9/17/2017 11:49am by Cheryl. Yep. It's always something around here. We even have our own code for it: ASF - Always Something Farm. This morning was one of those days. Before 8, Gesti started barking and we noticed that my cousin's cows were out of the pasture and darting across Highway 66. 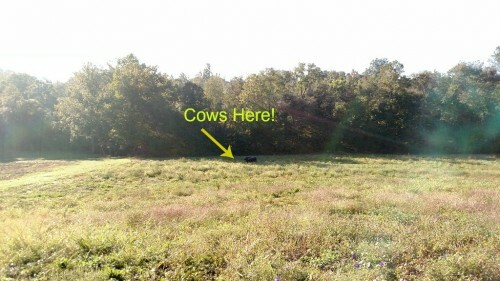 Not a good place for a cow to be. So off we go trying to keep the cows off the road and get them back in the pasture. It seemed like they were in the mooood for a stroll -- and even a run -- as they wandered all around the area. They were crossing creeks and nibbling on the smörgåsbord of tasty treats along their path: corn, soybeans, grass (they weren't interested in the tobacco though). Finally after about 1 1/2 hours, we were able to get them back in the pasture. All in a days work (Was this on the to-do list this morning?!). ASF! Whew! We feel like we dodged a bullet. Hurricane Irma kindly bypassed us -- just leaving about an inch of rain and some downed branches and tossed chairs. Heavy winds but thankfully no damage. We are grateful. And we also grateful to all of you who offered generators or ideas about who had them in stock. Our friends Deb and Don Fox at Greenberries Farm loaned us their generator on Friday so we were prepared -- just in case. And it was great that we didn't have to use it. Our hearts go out to farmers and others who were in Irma's path. Achieving some level of normalcy will be a slow and painful process for them. We are starting to see some results of the planting and seeding we have been doing! 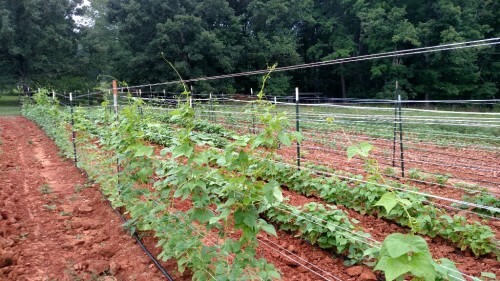 The beans are looking great -- both the pole and the bush! More trellising was needed as they keep growing. And there are lots of tiny beans on the vines! 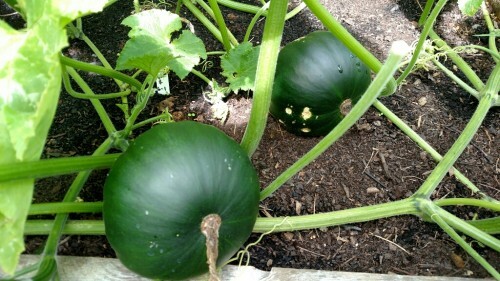 And the heirloom Seminole Squash are starting to produce! Good thing -- because the vines are about to take over the Demo Garden! We are about a month away from the beginning of garlic planting time. Seed garlic will be available from us next week. 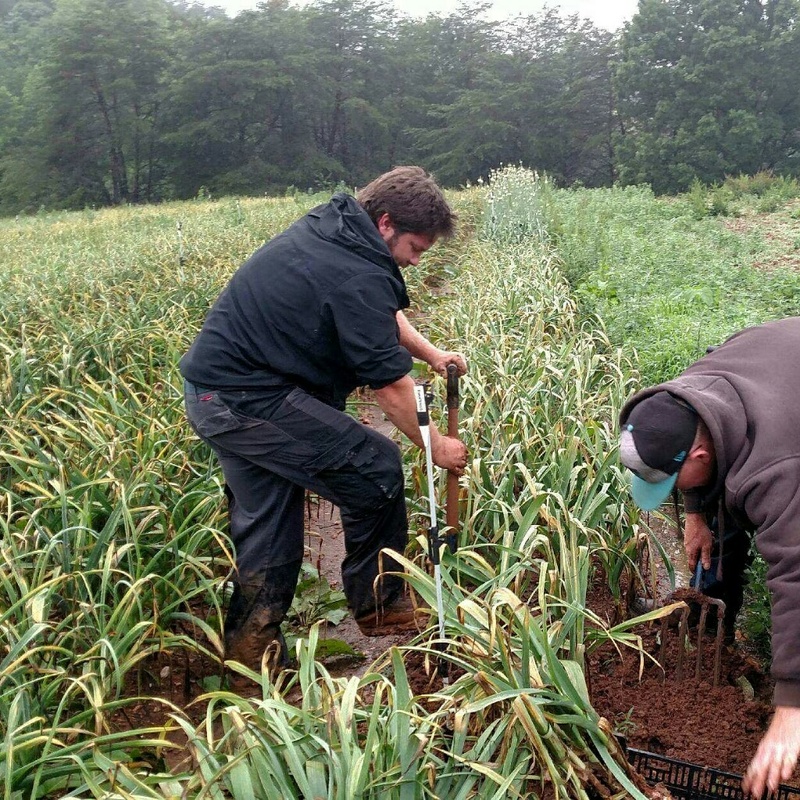 The great thing about buying seed garlic locally is that it is acclimated to our environment -- you aren't taking garlic from the Pacific Northwest or upstate New York and trying to get it to perform well here in the Piedmont. Plus it is Certified Organic! And don't forget our garlic growing workshop here at the farm on Sunday, October 8 from 2-5! Make sure you get your registration in soon since the class always sells out! For more information, check out our website. Tomorrow is the day that many of you have been waiting for! 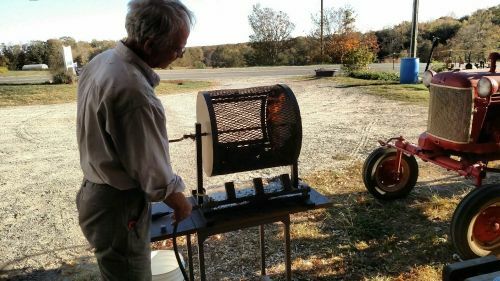 The return of the Chile Roaster! We will have our trusty roaster at market tomorrow -- follow your nose! Samples of freshly roasted chile and sweet peppers will be available and we'll have frozen fresh-roasted chile available for sale. We'll also have lots of other peppers: Shishitos, Poblano Peppers, New Mexico-type Green Chile, Ashe County Sweet Pimentos, Purple Beauty Peppers and some candy-sweet Picnic Peppers. Our Potato Bar is getting a bit thin but we'll have LaRatte Fingerlings and the last of the Bintje along with Creamer Potatoes and Teeny Tiny Taters. This week's featured GARLIC is Redneck Wild! and we'll also have Inchelium Red, Music, Chesnok, Lorz Italian and Elephant. You'll also find Garlic Powder, Microgreens, Pea Shoots, a little bit of Okra, Daikon Radishes (NEW!). Tomato Fruit Boxes (featuring our award-winning Chocolate Drops), a few Slicing Heirloom Tomatoes, the last of the Grimes Golden Apples, Heirloom Eggplant, the first of the Muscadine Grapes, Dill, Italian Parsley, Rosemary and more! If you would like us to hold an item for you, please let us know by 10:00 p.m. tonight. That's it for this week! Let's say goodbye to the Cassini Spacecraft which ended its odyssey at 6:30 a.m. today. I have been intrigued this week by all of the interviews and articles about this mission and the team that has worked so hard for so many years. After launching in 1997, traveling nearly a million miles and reaching the Saturn system in 2004, Cassini spent 13 years exploring the planet and its moons. The data and images led to numerous discoveries that changed how scientists think about our solar system. 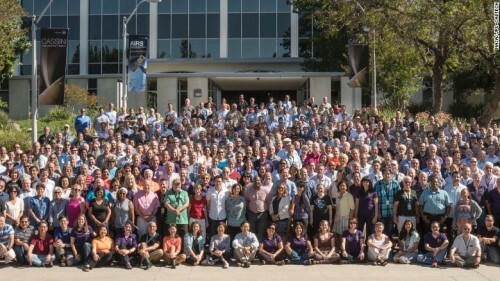 Here's a photo of the folks that developed and guided Cassini over the years. What amazing teamwork! Enjoy these last glorious days of Summer here on Earth! Plum Granny Farm Weekly Update September 8, 2017 -- Stormy September! Got Generator? Posted 9/10/2017 12:06pm by Cheryl. We're all a bit nervous around here today as we look at Hurricane Irma's path. Our thoughts and prayers go to those already impacted by the storm and we hope that those in her path have made their way to safety. We did get quite a bit of rain this week -- nearly 2 inches since Saturday -- but the new plantings were very happy for the moisture. And Brix? Maybe not so much. But after the rain and fog cleared on Wednesday, the air was super clear and crisp and everything looked amazing! More planting this week! 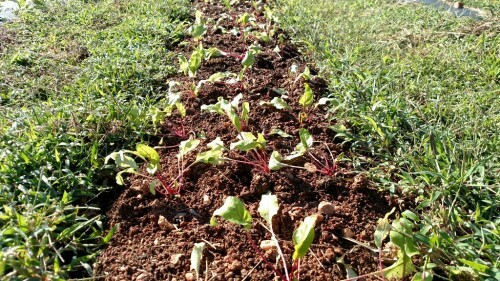 Beets, salad turnips, lettuce, collards and chard are all snuggled into their beds. Grow, little plants -- grow! 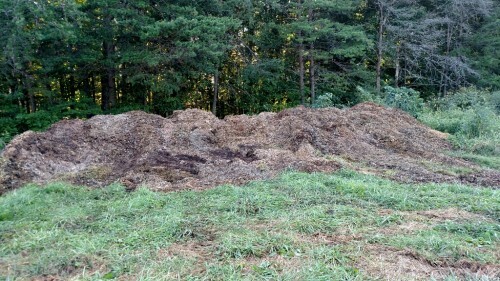 This will be great for use as mulch in pathways, along the farm road and more organic matter for our soil. Yippee! We were getting impatient for our ginger crop and decided to go ahead and harvest a little bit for our PlumFresh members this week. It's looking good -- but will do better with a bit more fertilizer and another hilling. You'll start seeing it at market in early October. Patience! Several of you have been asking about buying seed garlic from us. We will definitely have some and will start selling it in about 2 weeks. The "official" start to garlic planting season begins around Columbus Day (October 9) so you have plenty of time! 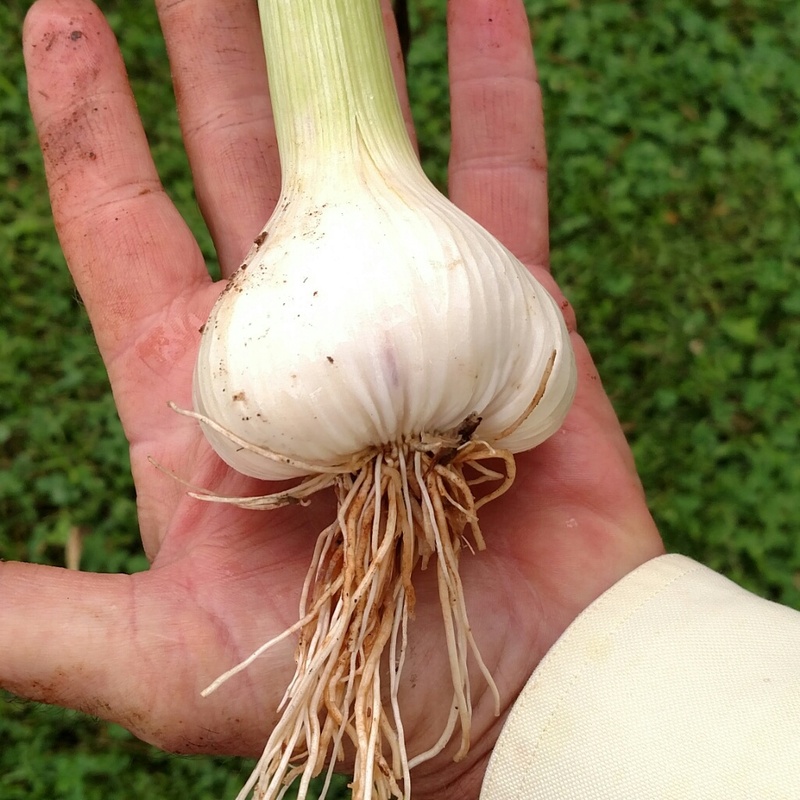 And don't forget our garlic growing workshop here at the farm on Sunday, October 8 from 2-5! For more information, check out our website. The Potato Bar will have LaRatte Fingerlings and Bintje along with Creamer Potatoes. You'll find lots of GARLIC! (this week's feature: Pyongyang along with Inchelium Red, Music, Chesnok, Lorz Italian and Elephant), GARLIC POWDER, Microgreens, Pea Shoots, some Okra, Tomato Fruit Boxes (featuring our award-winning Chocolate Drops), a few Slicing Heirloom Tomatoes, Grimes Golden Apples, Heirloom Eggplant, Muscadine Grapes, Dill, Italian Parsley, Rosemary, Garlic Chives, Mexican Mint Marigold (a substitute for tarragon with edible flowers) and more! If you would like us to hold an item for you, please let us know by 10:00 p.m. tonight. That's it for this week! Sunday is Grandparents Day, if you are fortunate enough to have them in your life, be sure to pay them a visit or at least give them a call. Our grandparents were very important as we were growing up. Both of us owe our farm connection to grandparents -- Ray to his maternal grandparents in Kansas and Cheryl to her paternal grandparents who farmed the land that we farm now. We miss them and sure wish we could have them here -- we'd definitely be asking them millions of questions! Wishing you and yours safety as Irma heads our way. Plum Granny Farm Weekly Update -- Welcome September! Posted 9/3/2017 12:46pm by Cheryl. Hello Farm Friends! Happy Friday! Happy September! Hard to believe that the calendar has turned again and that we are in September! But at least the month will somewhat match the cooler weather we have had the past week. Jackets and second layers have come out of the closet these chilly mornings. The trees are starting to subtly change colors and the air is heavy with morning dew. 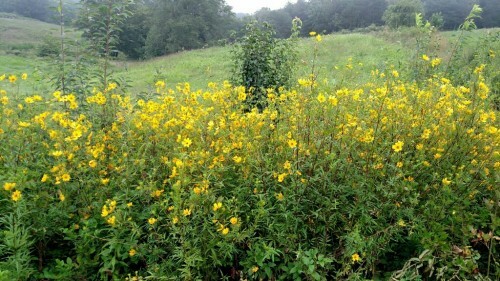 And the yellows of fall are popping up all over! As we move into fall, we start planning our strawberry crop for the next year. We decided to carry over this year's field and add some new plants -- both from tips that we have grown out as well as some from a great organic grower, Banner Greenhouse. On Tuesday, Cheryl drove to Durham to meet up with their truck and brought home about 700 really beautiful plants! We'll be planting around September 15. And speaking of planting, lots is still going on. Our new raised bed is now full of a couple thousand carrot seeds! Keep your fingers crossed!! Frisse is doing great in the Wally Caterpillar. Beans are really taking off! Shouldn't be long before we have blooms. 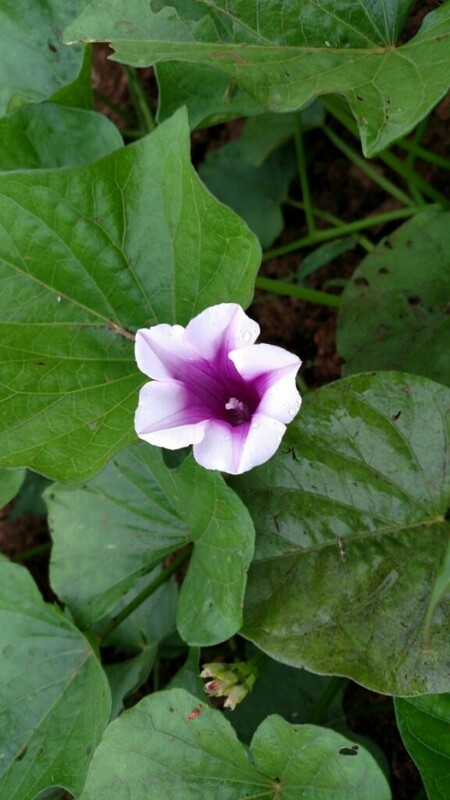 Starting to get the first flowers on the sweet potatoes. 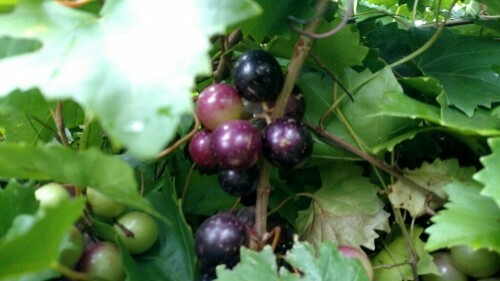 The muscadine and scuppernong grapes are almost ready -- we hope we will have them at market next week! We are getting great response to our 3rd Annual hands-on garlic growing workshop here at the farm on Sunday, October 8 from 2-5! This very popular workshop will provide extensive information on garlic growing as well as an opportunity to plant garlic in a raised bed. 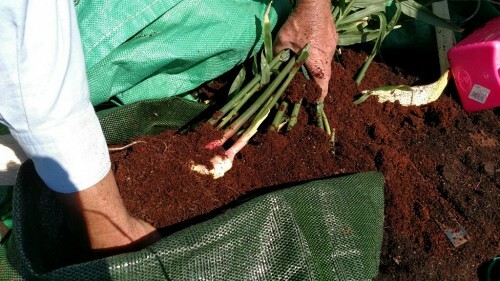 In addition to instruction, participants will receive 1/2 pound of Certified Organic seed garlic. Class size is limited to 15 participants and registration and prepayment is required. Cost of the course is $32. Please email us at farm@plumgrannyfarm.com for a registration form or pick up one at market. What Will Be On Our Table? 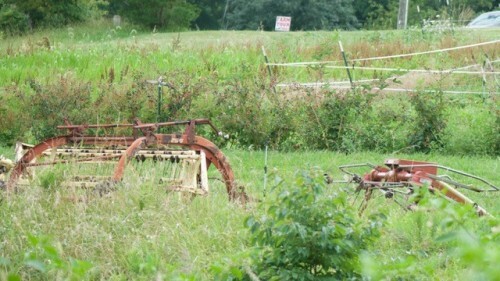 We are still in-between on lots of crops but we will have a nice array of items tomorrow at Cobblestone Farmers Market! A new item this week is super sweet Picnic Peppers! These little peppers have almost no seeds and are candy-sweet and oh-so-pretty! We'll also have lots of other great Certified Organic produce on our tables. In the pepper world, we'll have Shishitos (and back by popular demand samples of the Creamy Chilled Shishito Pepper Soup! ), Poblano Peppers, New Mexico-type Green Chile, Ashe County Sweet Pimentos, and Purple Beauty Peppers. The Potato Bar is stocked with LaRatte Fingerlings and Bintje along with Creamer Potatoes and Teeny Tiny Taters. You'll find GARLIC! (this week's feature: Spanish Roja along with Inchelium Red, Music, Chesnok, Lahontan, Lorz Italian and Elephant), GARLIC POWDER, Microgreens, Okra (we have more this week! ), Tomato Fruit Boxes (featuring our award-winning Chocolate Drops), Slicing Heirloom Tomatoes, Grimes Golden Apples, Heirloom Eggplant, Dill, Italian Parsley, Rosemary, Garlic Chives and more! If you would like us to hold an item for you, please let us know by 10:00 p.m. tonight. We are keeping the folks in Texas and the Gulf in our hearts and prayers this week. Cheryl's nephew and his family live in Houston and were seriously impacted by Hurricane Harvey. Their house was flooded and they have been staying with friends -- at least they are safe. In addition to those in the urban areas, many farmers and ranchers have been devastated by the flooding and torrential rains. Let's all try to do something to help the folks in this area. Only by pulling together can we help our fellow citizens pick up the pieces of their lives. Posted 8/26/2017 10:40pm by Cheryl. Today at Cobblestone Farmers Market, folks got an opportunity to sample this new recipe. As much as we love the basic charred shishito peppers, it is great to have something else to do with them. The response to the soup was overwhelmingly positive! Give it a whirl -- it is a simple and easy thing to make -- and it takes very little time! In a frying pan, heat oil and garlic on high heat. Add peppers. Cook Shishito peppers until blisters appear on the skin (~5-7 minutes). Place peppers and all ingredients into a blender or Vitamix. (Note, if you do not use a Vitamix, make sure you roughly chop up your vegetables first.) Puree on medium speed for 30 seconds. Make sure peppers are pureed. Place in an airtight container. Chill in the refrigerator 3-4 hours. Serve chilled. 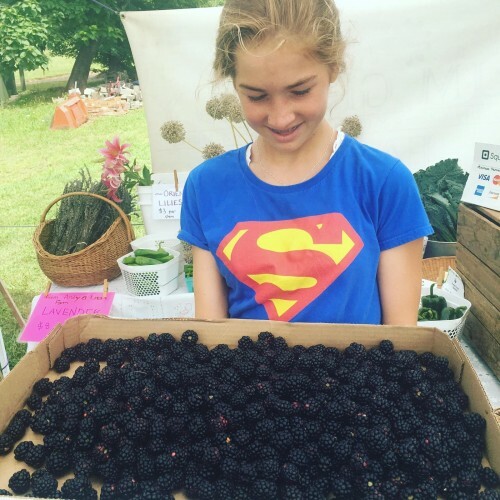 Plum Granny Farm Weekly Update -- Berry Good! Posted 7/9/2017 11:40am by Cheryl. Hello Farm Friends! Happy Friday! Welcome to July! The familiar heat and humidity of the month are settling in -- ah, summer in the South! But the cicadas have started their sweet summer song and the okra, sweet potatoes and peanuts are enjoying their favorite kind of weather. Let's make the best of this, shall we? The garlic harvest is over (yay!!!) and the potato harvest has begun. 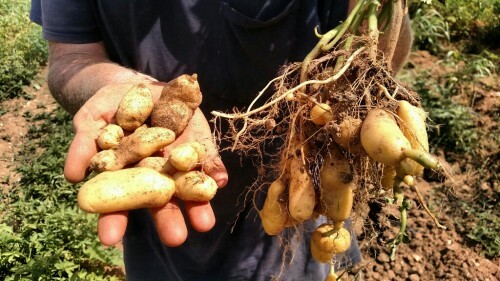 Yesterday we started harvesting the LaRatte fingerling potatoes from Ruth's Field. The conditions were perfect -- the soil was dry so it just fell off of the potatoes. A pretty respectable yield so far! Farm life challenges one to become creative. There are always machines that need to be fixed and work-arounds to be engineered. I think the term "hack" must have come from a farmer. We are quite adept at farm hacks. 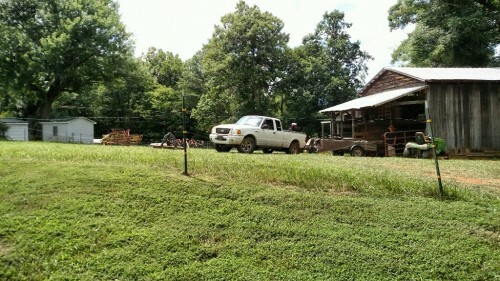 Our most recent challenge has been with our truck, Farmy. It seems that the transmission is failing so it will not go into reverse. Do you know how many times you need to back up a farm truck?? So we are learning how to position the vehicle so that gravity will do the trick for us. Pretty impressive, huh? 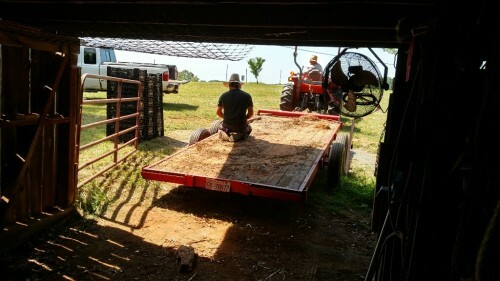 Here's Jonny getting a trailer into the barn -- that's stunt-driver worthy! We celebrated the 4th in true Plum Granny Farm style -- with a blackberry pick-your-own! It was a perfect morning and the berries were plentiful. Close to 100 pounds of berries found their way home with our happy customers. Thanks to Dorothy for sharing this great photo of her daughter! We'll be at Cobblestone Farmers Market in Old Salem Saturday from 9-noon. You will find lots of Certified Organic produce including several varieties of FRESH GARLIC and hopefully some of the first cured garlic, BLACKBERRIES, Shishito Peppers, Caraflex and Napa Cabbage, Kale, Swiss Chard, Cucumbers, fresh Green Chile, Poblano Peppers, Jalapenos, bunches of Italian Parsley and Basil, along with our everlasting garlic flowers. 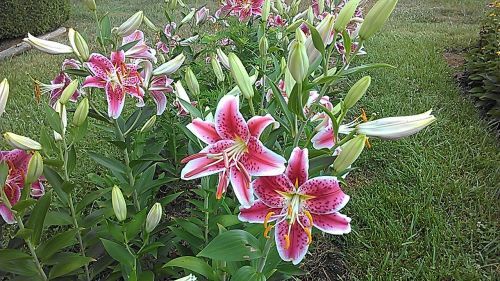 We'll also have our heavenly-scented Stargazer Oriental Lilies! If you would like us to hold an item for you, please let us know by 10:00 p.m. tonight. That's it for now! Enjoy Sunday's Full Moon rising at 12:07 a.m. This is the Full Buck Moon because at this time of year, a buck’s antlers are in full growth mode. This full Moon was also known as the Thunder Moon, because thunderstorms are so frequent during this month. Of fireflies eddying nigh, — And that is July! 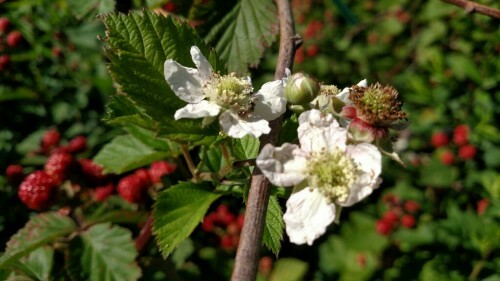 Plum Granny Farm Weekly Update -- Red, White and Blackberries! Posted 7/3/2017 3:40pm by Cheryl. Wow! 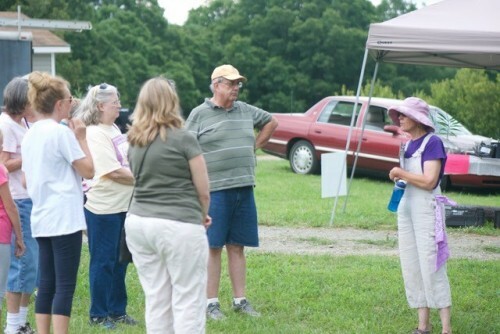 We are still amazed at our terrific turnout for last Sunday's Northern Triad Farm Tour! And probably a bit dazed as well. We had nearly 200 people visit the farm!! 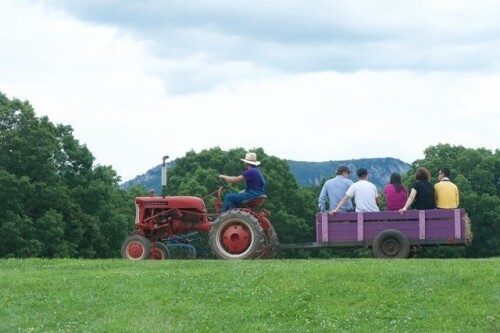 Thank you so much for sharing a bit of farm life with us -- lots of familiar faces and bunches of new folks too -- it was great seeing you enjoy our farm. We are still trying to put away the errant sign or hay trailer but we are slowly getting back to our so-called normal around the farm. Extra special THANK YOUS go out to our amazing volunteers -- Orville, Annette, Jenny, Bob, Millis, Matt, Katie, Rett, Thor and Jonny along with Debbie and the Plum Granny Pickers! A million thank yous to all of you for helping us pull this event off! 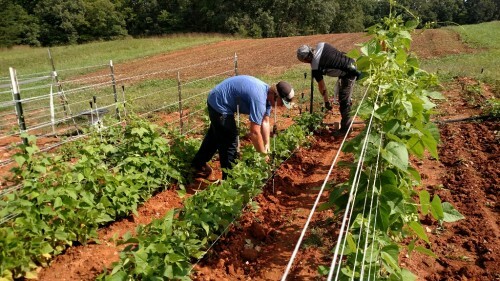 There was a terrific article in today's The Stokes News about the tour -- many thanks to Amanda Dodson for coming out to visit the farm and for spreading the word about how farms build community! The participating farms logged in more than 600 visitors. Enjoy a few of the photographs from one of our volunteer photographers, Rett Alsbrook, shared. As we try to stop our head from post-tour spinning, we've been trying to concentrate on getting garlic harvested, trimmed and hung. This is the time of year when we play "Trailer and Curver Rubik's Cube." Garlic seems to be EVERYWHERE! We've had garlic spread out on trailers in any protected space that we can put them. But then we need the trailers for other things (like hay). We use curvers (aka bulb crates) to store garlic while we are waiting to grade it for size or after it has been graded and is waiting to be hung -- but we need the curvers for potato harvest. And sometimes you find yourself trying to squeeze a trailer out of a very tight space (how did Ray get this thing in here?!) to make sure the garlic is sheltered. So we unload, reload -- twist and turn. It can be a rather difficult game to play -- but somehow we make it work (by the hair on our chinny, chin, chin!)! Photo Note: Objects are MUCH closer than they appear!! We had about an inch to spare on either side of the trailer as Ray pulled it out of the barn. Last Friday night and early Saturday morning, we had some pretty heavy winds. 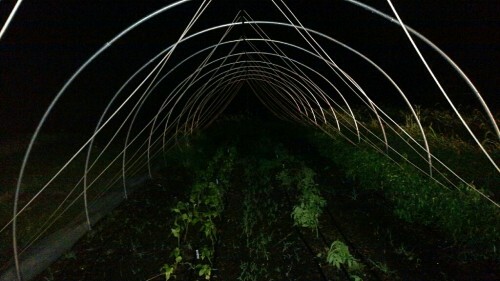 We had been having some challenges with the cover on our new caterpillar tunnel, so Ray ventured out at 1:00 a.m. to check it. Not good news. The cover had completely blown off -- but the good thing is that the ropes that hold it on were intact, so the plastic had just collapsed on one side. I'm really glad that it's summer and we don't have to worry about cold temperatures! We got the cover back on yesterday -- all's well! But we will be using a different cover attachment method for our next caterpillar, for sure! The blackberries are starting to come in -- some of you were able to snag a pint of Ouachita berries last weekend. Our largest planting, Triple Crown, is just starting to ripen. 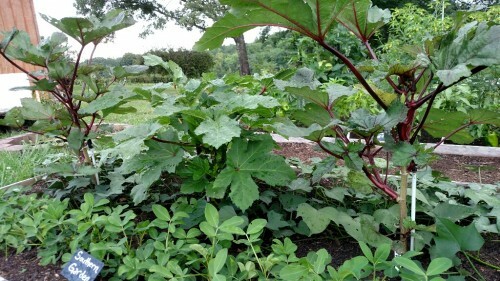 To celebrate the 4th of July, we are planning a Blackberry Pick-Your-Own on Tuesday, July 4 from 9-noon. We hope to have several blackberry PYO days this season, so don't worry if you can't make this one! I guess the third time is really the charm! 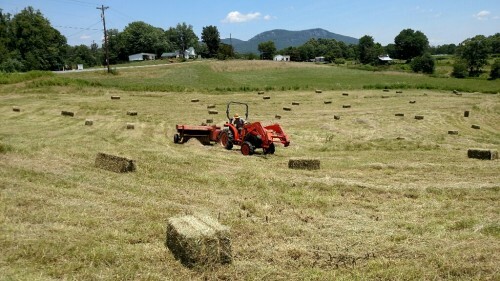 After a couple of unsuccessful attempts, we finally got the rest of the hay up yesterday. We need 4 good, dry days in a row to make hay, and this week the weather and timing was perfect. It's a beautiful and fragrant crop. Is that Tony I hear...? Harvest Help Wanted! 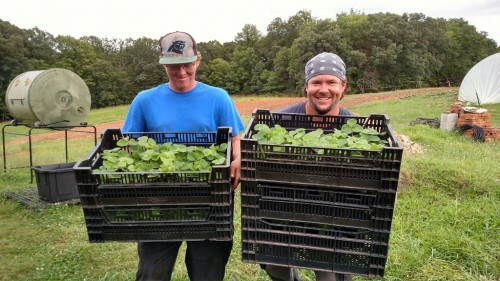 If you (or an interested and responsible teen child) are looking for a part-time job, we are looking for a couple of folks to help us with berry and other crop harvest. Contact us for more details. That's it for now! May you have a fun and safe Independence Day weekend! Make sure your pets are well-secured during fireworks displays. Plum Granny Farm Weekly Update -- Anybody Got an Ark? Posted 5/28/2017 1:02pm by Cheryl. Okay -- if I start talking about how dry it is again, please stop me. I think I may have wished a flood upon us. 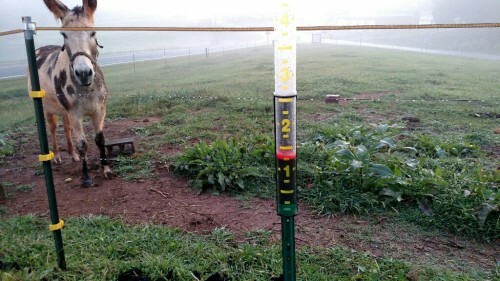 Since we last spoke, we have gotten over 4 inches of rain. Yesterday we were spared as tornadoes moved through our area. We were very lucky -- far luckier than many of our friends and neighbors. 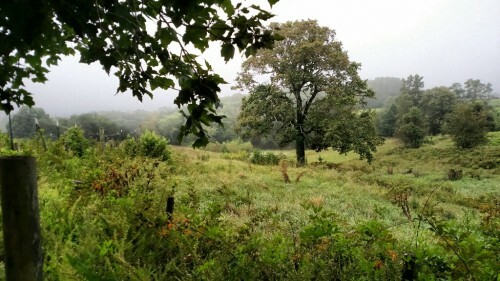 Our friends at Felsbeck Farm (Connee and J French) did get hit by the tornado -- they are about 3 miles away. There were lots of downed trees and power lines with some damage to buildings and crops -- but it could have been a lot worse. Just down the road from them, the tornado destroyed the home of Chris Overby's mom and her husband (Chris is our employee) -- thank goodness they weren't home at the time. We count ourselves very fortunate and are trying to help our friends where we can. Please keep these folks in your thoughts and prayers. We'll be at Cobblestone Farmers Market Saturday from 9-noon. You will find lots of other Certified Organic produce including lots of GARLIC SCAPES, Snow Peas, Sugar Snap Peas, Florence Fennel, Escarole, Fancy Pants Salad Mix with edible flowers, Kale (Dino/Lacinato and Vates Curly) and Swiss Chard. In smaller quantities: Strawberries, Artichokes, sweet and crunchy Cucumbers as well as garlic powder. Our beautiful hanging Strawberry Baskets would make a nice hostess gift for your Memorial Day gatherings. These everbearing Seascape strawberries will produce until frost -- they would love to hang out in a sunny spot at your house. Several of them already have ripe berries! We will also have a nice selection of Certified Organic transplants (peppers, herbs, edible flowers, eggplant, tomatillos, kale and more). Wishing you the best on this Memorial Day weekend. The weekend always holds special meaning for us since both of our fathers served in World War II. Ray's dad, Bill, was a career Army man and also served in Korea. Cheryl's dad, Holt, enlisted in the Army at the beginning of World War II and was stationed in the Philippines. The photo below was taken at the World War II Memorial in 2004. Our deepest appreciation goes out to all those who have served our country -- in wartime and peace. Take a moment this weekend to say "Thank You" to a veteran -- and if you are one, our special thanks to you. Plum Granny Farm Weekly Update -- Day 2 of Plant-a-Palooza! Posted 4/24/2017 4:07pm by Cheryl. Seeing that wonderful orb of sun on Wednesday was such a balm for the soul! I'm not sure I've ever been so happy to see sunshine! After 5.5 inches of rain since Saturday night, we (and the crops, and the animals) were quite delighted for a dry day! I know that our totals don't touch the larger rainfall amounts that others got. We heard reports of 8 inches and more. Our hearts and prayers go out to the farmers that are having to deal with that aftermath. Despite all of the rain, we had a FANTASTIC turnout for the first day of our Open Greenhouse and Plant Sale! It was raining all afternoon and people just kept on coming! Thank you so much for your show of support (and fortitude!) We especially thank our wonderful volunteer, Annette Helsabeck for donning her rain jacket and boots to help us! And we are doing it again THIS Sunday (4/30) from 1-5 p.m.! We have restocked our inventory and have LOTS of Certified Organic plants including many heirloom and hard-to-find plants! 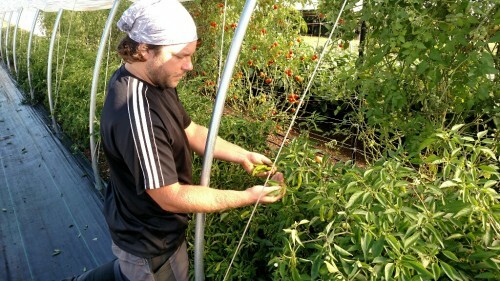 We've got tons of tomatoes (39 varieties), piles of peppers (sweet & hot -- 13 varieties), eggplant, herbs (21 varieties) as well as veggie transplants and dwarf sunflowers. 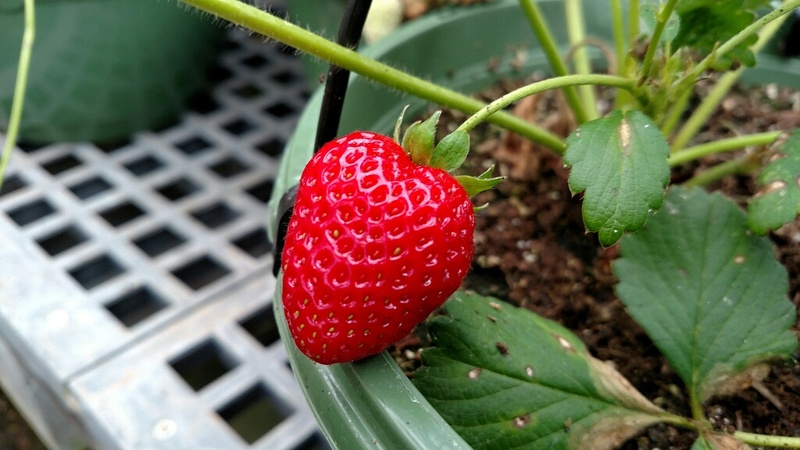 You'll also find strawberry hanging baskets (everbearing - fruit all summer!) along with ginger and turmeric plants and some seed potatoes. To keep your plants healthy, we'll have a selection of our favorite organic soil amendments. We'll even have some fresh produce! 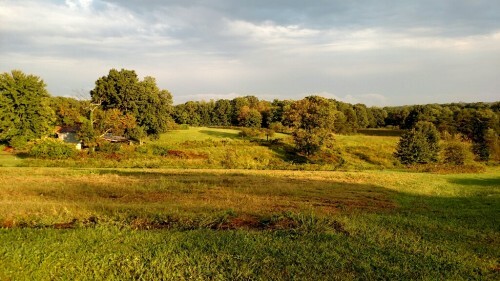 The weather forecast looks pretty good for Sunday, so take a drive up to beautiful Stokes County! Once things dried out some, we were chomping at the bit to plant! We got the first of the tomatoes in along with some kale in South and seeded the first succession of beans (bush and pole). We are updating our Demo Garden beds and planted the Salsa Garden yesterday. In last week's newsletter, I forgot to include a really cool photo of the queen cell from one of our top-bar hives. Ray recently split the hive and went back to check the status of the new queen in one of them. He found it! See the enlarged cell in the circle? That's the cell for the baby queen bee. Cool, huh? The rain has done a number on our asparagus and strawberry production this week, so we will have less available. Despite that, we will still have lots of Certified Organic spring goodness including Spring Garlic, purple and green Asparagus, Salad Mix with Frissé and edible flowers, Swiss Chard (baby and full-size), Curly Vates Kale, our sweet and crunchy Cucumbers, Shallot Flowers, some strawberries, beautiful head lettuce (red and green), Pac Choi, Tat Soi and some Microgreens Mix along with garlic powder and granules and ginger powder! And don't forget the jam! That's it for now! Today is Arbor Day which has been celebrated since 1872. It began in Nebraska, a largely treeless plain back in the 1800's. It is a day to plant and dedicate a tree to help nature and the environment. Millions of trees are planted on this day. Take a moment to appreciate your favorite tree or make plans to plant one. Plum Granny Farm Weekly Update -- Hop To It! Posted 4/14/2017 9:32am by Cheryl. Busy, busy, busy! That's the buzzzzz that's going on in our heads this week! Trying to keep the balance of planting, seeding, weeding, setting up irrigation takes some doing, for sure! There are definitely days where we come to the end and see as many unchecked items on our to-do list as we do the ones with check marks. We LOVE check marks -- and wish we could see a full page of them at the end of the day. But there are always good reasons -- irrigation glitches, ornery tractors, rescuing lost dogs, splitting up a hive of bees that are ready to swarm... Interruptions seem to be the norm -- or as we call it, Always Something Farm (ASF)! Weeding has been high on the priority list for the week. Despite having been weeded three times already, the garlic looked like it had never been touched. We all jumped in to tackle that project -- with Chris and Jonny doing most of the heroic efforts. But at the end of all this hard work came a rainbow at the end of the day -- Klondike Bars!! Another major task for the week was getting the potatoes planted . 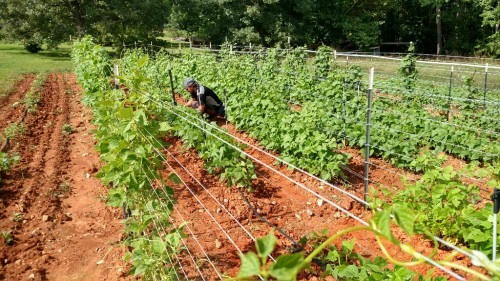 There are now 16 rows of potato-y goodness tucked into Ruth's Field! Look for them to start showing up at market in late June and early July! Our snacking cucumbers were a big hit at market last week! There will be more this week and hopefully for weeks to come. We have 30 more plants to set out! Our ginger and turmeric are very near being ready for planting. The seed pieces are still in the milkhouse in the pre-sprout stage -- there are lots of roots and active growing tips. And there are even some that are saying "Plant Me!" now! Don't forget that we will have Ginger and Turmeric plants available at our Open Greenhouse and Plant Sale NEXT Sunday, April 23 and April 30. Chris and Ray got the sites for the next two caterpillar tunnels, Mama Meow and Ajo, set. Perhaps it was the fact that we decided to use our cat names for these tunnels or it was just the excitement of the measuring string, RingBob decided that this was a fun task to get involved in! Kittens can make it tough to make precise measurements! We had a GREAT opening weekend at Cobblestone Farmers Market last week! Thank you! It was wonderful to see our friends (you!) back at market!! It will be busy in Old Salem this weekend. On Saturday they will be hosting their Easter Festival from 9:30-4:30 complete with an Easter Egg Hunt at 11:00 a.m. Take this into consideration as you travel to market tomorrow. We will have lots of Certified Organic spring goodness including Spring Garlic, purple and green Asparagus, Salad Mix with Frissé, Swiss Chard (baby and full-size), Kale, Snacking Cucumbers, Beets, Shallot Flowers (try these with your eggs for Sunday Brunch! ), Collards (a few), garlic powder and granules, along with our new ginger powder and some bunches of tulips! And we will also have our delectable jams -- check out the Raspberry-Cranberry to go with your Easter Ham! We hope to see you on Saturday -- should be a nice day for market. That's it for now! We wish you and your family a wonderful Easter and Passover season. Take a moment to look around you at all of the amazing signs of Spring and the rebirth that the Season brings. 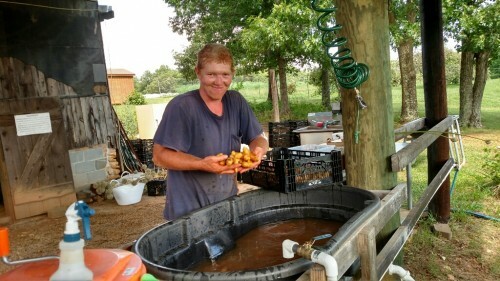 Plum Granny Farm Weekly Update -- No Foolin'! Posted 3/31/2017 3:17pm by Cheryl. If March came in like a lion, it's going out like a trout! Wow! We had a LOT of rain overnight and this morning. Nearly 1.5 inches so far with more predicted this afternoon. After a fairly dry winter, we have been making up our precipitation levels over the past couple of weeks. Right now the fields are saturated -- the garlic almost looks like it is growing hydroponically! But the fields dried out enough from the earlier rain so we were able to shape beds. Thanks to Ray, Chris and the NC A&T bedshaper, we got 45 beds shaped (and some covered in plastic) before the latest deluge began. We've got a whole lot of planting to do now! And speaking of planting, we've been doing that too! 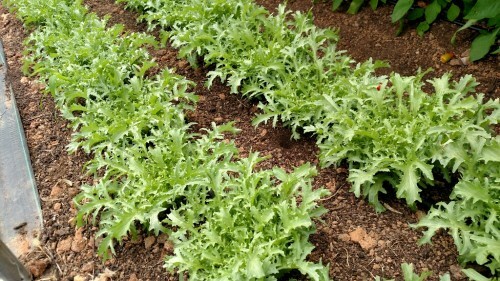 Lots of lettuce, pac choi, bok choi, tatsoi and some kale have moved from their trays and into the field. The new caterpillar has one bed of lettuce -- looking good! 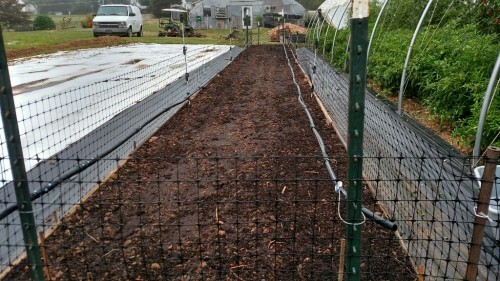 We have continued to work on the caterpillar -- shaping beds and adding irrigation -- along with tweaking the plastic cover. Now it doesn't flap so much in the wind. Thanks for the suggestions for names for the new caterpillar hoophouse! We decided that since we were calling it "Cat #1," we would go with the cat theme. So we are naming the tunnels after some of our cats: the first one is "Wally" and "Mama Meow" and "Ajo" will be the next two. Maybe butterflies after that. Market Season is Almost Here! This is NOT an April Fools joke! 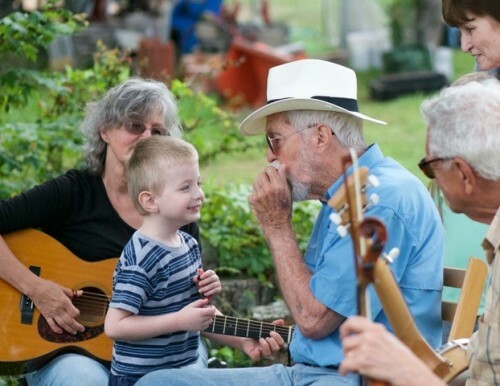 The Cobblestone Farmers Market at Old Salem will start next Saturday (April 8) from 9-noon. With market on the horizon, "vacation time" is over!! It's time to step up our game even more to get everything ready for show-time! Markets really are a lot like a theatre or musical performance! We'll have some great early season crops for you -- more details next week! 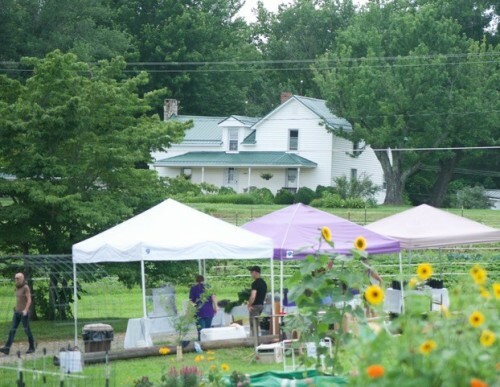 We will also be doing a market at the farm this year starting in late May-early June. It will be on Wednesday afternoons in conjunction with our PlumFresh pick-up time. This market will take the place of our participation in the King Farmers Market (which will start on April 19). Only 3 memberships left for PlumFresh!! The opportunity to participate in PlumFresh is quickly disappearing! If you've been thinking about it but just haven't gotten your application in, NOW is time! For more information and an application, please click here. That's it for now! We'll leave you with some of the signs of spring that we've spotted this week. P.S. Just as I was ready to hit "send" on the newsletter, the trucking company came with a load of 4 pallets of soil amendments from Seven Springs Farm Organic Farm Supplies. Yikes! This is our big annual bulk order that we coordinate to help fellow farmers in the area get better prices on soil amendments. With no helpers scheduled today, no pallet jack, and rain starting, it was a scramble!! Thank goodness that Jonny lives close by so he could give us a hand! It's all done! Whew!